And the latest neuroscience research PROVES that meditation techniques have beneficial effects on both your mind AND body. If you’re overwhelmed with worry… or there’s a roadblock… SOMETHING holding you back from a goal or dream or happiness (but you’re not sure what it is). Today’s reductionist society breeds disconnect. We try to zoom in on one little thing -- like “superfoods” or pre-workout shakes or ab crunches -- rather than see the BIG totaltarian picture. We need to stop slicing and shoving different parts of ourselves and our lives into different boxes and thinking about them like they are somehow not connected. Meditation brings you back to your true self. RECONNECT. ELIMINATES stress and anxiety. While stress may return to your life, it’s more manageable and you avoid the dreaded “when it rains it pours” effect. ELIMINATES insomnia -- this alone is worth the effort for me. Drift off to sleep easily and sleep soundly. FOSTERS creativity, positive emotion, clearer thinking, intuition, and the ability to multitask. Some of the most successful people (like Oprah and Steve Jobs) have used meditation. INCREASES self-control, social connection, memory, and your ability to regulate your emotions. IMPROVES health. Meditation can lower blood pressure, decrease pain, and strengthen your immune system -- even change the cellular biology of aging! I can promise from my own experience that meditation will create positive changes in your life! Meditation has been a huge part of my map to self-discovery (and recovery). Meditation helps you reconnect with yourself and what you need to thrive. Meditation enabled me to regain control over my mind so I could decide how to act, feel, or engage -- rather than just REACT. Think of meditation as a flashlight into YOUR consciousness. Now I know meditation can feel strange and foreign (at least, it did for me). So if you’re curious… confused…. intrigued… about meditation…. 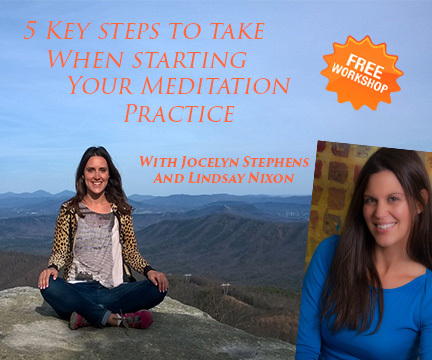 Come to my pal Jocelyn’s meditation workshop tomorrow! Normally this workshop is $39.95 but it’s totally FREE for members tomorrow! Are you READY to create a greater sense of peace, balance, and relaxation in your life? P.S. I really can’t stress enough how great a deal this is! Jocelyn’s workshop is AMAZING *and* you’ll get a month of meal plans (plus full access to the new forums, all the free cookbooks and other perks!) for HALF the price of the workshop ($39.95 value). A 50% savings!! But the benefits from daily meditation can’t even be computed! IMAGINE how amazing it will be to free yourself from the worry of the all the small things… to live without stress… without INSOMNIA, stress, and all that spinning in your head… takes just 10 minutes! Experience the benefits of meditation + end your "what's for dinner hassle" now. P.P.S.A new Meal Mentor podcast is ready for you! In this episode Kim (my copilot!) shares how switching to a plant-based diet helped her avoid gallbladder surgery and lower her cholesterol. A mom of 2 teens as well, Kim shares her strategies for making it work when you’re BEYOND busy, including quick-n-easy meals she makes (and her kids make!) when she doesn’t have time to cook or prep ahead AND how you can get kids on board with a plant-based diet. Don’t miss her AMAZING parenting tips or her testimonial of the power of positivity for coping with OCD!